Used at bridal shower. Excellent and beautiful. A touch of classic style and charm for any table, this tablecloth is made from a premium linen blend and incorporates an embroidered swirling scroll design along the border. The neutral natural color is easy to coordinate and the impressively durable design creates a timeless and stylish addition for years to come. Dimensions 36.0 In. X 36.0 In. X 0.25 In. It was not the size of the table I had to purchase another table cloth to accommodate the look I wanted. Wouldn't recommend it for a 30 inch table although it was supposed to be for a 36 inch table. I just received my tablecloth and it's perfect for any occasion! Looks exactly like the photo. Crisp and classy! Good with any style! Love it! Thois is a well made tablecloth for a fraction of the price. It is hard to find a cloth that can cover a 166" length this covered it perfectly and was of heavy weight. 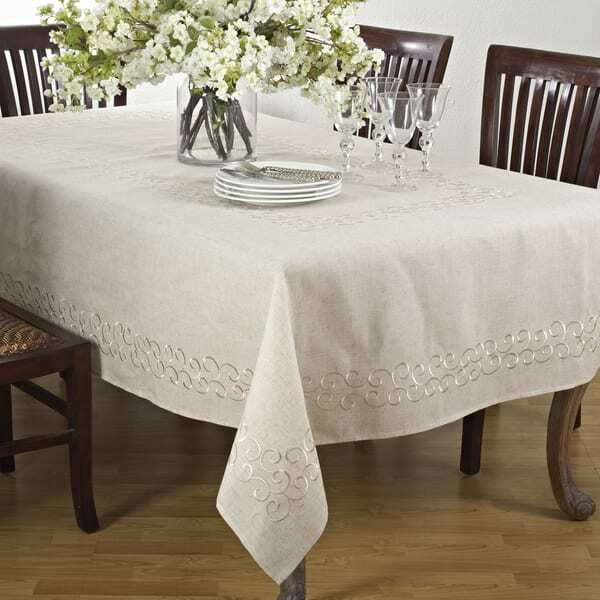 I ordered this embroidered linen tablecloth for my round kitchen table. The tablecloth looks very pretty and elegant but I realized that the material is not very soft even after washing it a few times. Although the pattern is beautiful and it fitted perfectly my very long table, this tablecloth doesn't wash, period! It's dry clean only.To me it doesn't make sense. It would be nice on a table that isn't used for eating only as a decoration really. This tablecloth is beautiful. I ordered five of them for my daughters bridal shower and had so many compliments on them. Multiple people have asked to borrow them for their events. Love them! I have a large table (once extended) and had a hard time finding something online to fit that was not custom. This fit, looked beautiful and even washed up beautifully after Christmas day! I have a huge table so I purchased this table cloth which seems big. What I did not know was how beautifully this cover was designed. The broderies make it look so rich and expensive. I now use this cover on special events or when I have guests. Love the table cloth. It looks so elegant... I purchased it with the napkins. I think it will look fantastic. Purchased this tablecloth for my thanksgiving extra seating table. Loved it so much that I ordered another one to match. Beautiful fabric, perfect color for my theme. Would buy it again. I love love love this tablecloth. it goes perfect in my breakfast room and dining room and it is very easy to clean. I love the linen look. Very nice quality and very pretty. It is creates a great backdrop for decorating options. I use it every Thanksgiving. Great size options. Purchase a second one for the "kids" table. Matching napkins also available on Overstock. Was looking for an ivory tablecloth. This does have a lovely swirl design. However, I wish that the fabric was more smooth. It really does not feel like linen. The fabric gives the tablecloth a more casual appearance. Been looking for something classic, yet contemporary. It can be simple or dressed up, depending on the tablescape. Looks much more expensive. Great price, Overstock! I was looking for simple elegance that would not take away from my china pattern.